London is a large and sprawling city and is definitely worth seeing from high up. 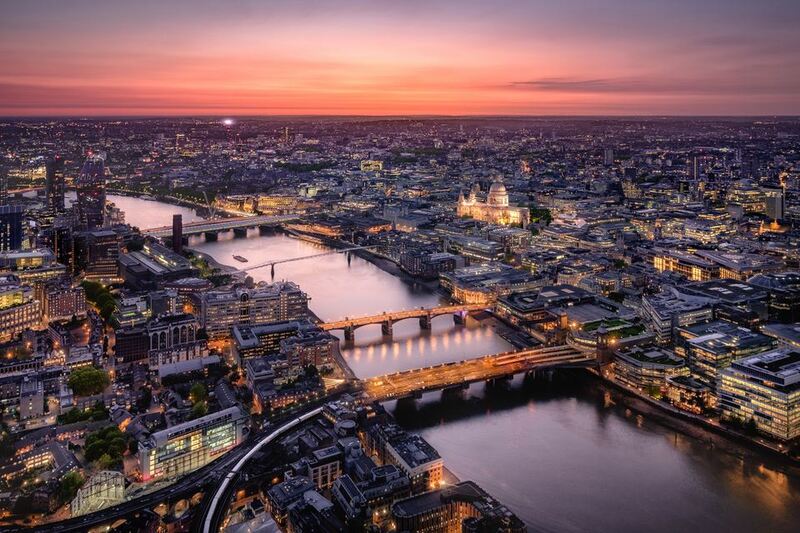 Find out how you can enjoy London from a higher level. Sky Garden is on top of one of the skyscrapers found in London. You can visit levels 35 through 37 of the "Walkie Talkie" for free—just make sure to book a ticket in advance. The View From The Shard is the tallest viewing platform in central London with an indoor and outdoor viewing platform on levels 69 and 72. The Shard is 1,016 feet tall and sits centrally among the West End, Westminster, the ​​South Bank, the city, and Canary Wharf. This centralized location means it has one of the best viewing opportunities in London. The ​Coca-Cola London Eye is 443 feet high and has 32 capsules. It has been the most popular paid-for UK visitor attraction for many years. It has a great location on the South Bank, opposite the ​​​​Houses of Parliament and the views include Buckingham Palace, Royal Parks, and beyond. The O2 is an iconic building in North Greenwich and in 2012 Up at The O2 was added as an attraction. It literally means you climb over the top of the building. The central observation platform at the summit is 170 feet high and has some great views. The climb is slightly strenuous but totally worth it. You can see Historic Royal Greenwich, the London 2012 Olympic Park, plus Canary Wharf and through to the City of London and central London. London got a cable car across the River Thames in 2012 (called the Emirates Air Line) and this is, technically, public transport although many people think it's fun and not commuting. The journey is a little more than .5 miles and is 295 feet above The Thames at the highest point. The cable car connects North Greenwich, home of The O2 and Emirates Royal Docks terminal, which is a short walk from ExCeL London. There are three galleries to climb up to in the dome of ​St. Paul's Cathedral. The first, the Whispering Gallery, is only available indoors and reached by climbing 257 steps (almost 100 feet). Do not start the climb if you do not think you can make it as it's one way up and another way down. The Stone Gallery offers some great views as it's an outside area around the dome and you can take photos from there. It is 376 steps to the Stone Gallery (173 feet from the cathedral floor). At the top is the Golden Gallery reached by 528 steps from the cathedral floor. Tower Bridge Exhibition has two high walkways at about 140 feet above the River Thames. At the end of 2014, glass floor panels were added so you now watch the traffic on the bridge and the boats going under the bridge. The ArcelorMittal Orbit was classed as the UK's tallest sculpture when it opened on the London 2012 Olympic Park. Designed by Anish Kapoor, the Orbit offers excellent views into the Olympic Stadium and of the redevelopment of east London. The Monument is, apparently, the tallest isolated column in the world. It's not horrifically high at just 202 feet and, visitors can only reach 160 feet high as that's where the caged-in viewing platform is. You do have to walk all the way up, and all the way down, and there are 311 steps. This time you do have to pass other visitors on the steps, so leave big bags at the bottom as it's a spiral staircase all the way. But achieve the climb and you'll be rewarded with a certificate when you leave. There are many restaurants in tall buildings in London as dining with a view is always pleasant. Whether it's a view of the River Thames, the City of London, or into the Queen's garden at ​​Buckingham Palace, all of the restaurants listed offer something special. Westminster Cathedral, not to be confused with Westminster Abbey, has the tower viewing gallery 210 feet above street level. The cathedral is near Victoria so the views are best over south and west London. Consider taking a 30-minute sightseeing tour over London. Some flights take off from Stapleford in Essex (east of London) and fly over Greenwich and followed the River Thames up through central London. The flights usually pass the Houses of Parliament and then turn around for the return journey.